Ugly Overload: A Green Spider? It could be a wolfy, yeah. I can sorta make out the eyes. Something that should be watched is if the abdomen is yellow and not brown. I can't tell the difference via the photo with being partially colorblind and the image being kinda grainy. OH.. and not that I know the spider but yellow, in general, is a bad sign. It's hard to see the eyes, but it looks to me like there is a row of four across the face, not two large ones. 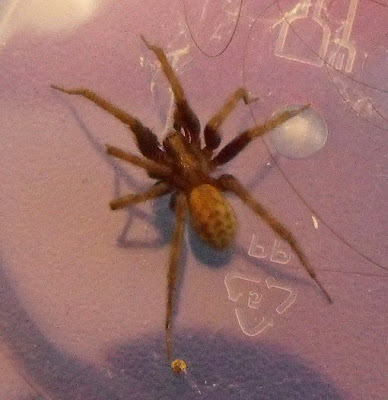 Given where it was found, there's a good chance it is a European House Spider, at least it looks quite a lot like the ones we find in our house. "OH.. and not that I know the spider but yellow, in general, is a bad sign." Not that kind of yellow, which I wouldn't even call yellow. I'd call it brown. It's yellows like THIS: http://robbsnet.com/fire_salamander.jpg that should make you think twice. I agree it's a European House Spider. I don't know, but if they were coming out of my bathtub drain I'd freak out. I'd probably pour some poison down on them! Sorry! It also looks like it could be a domestic house spider. The site I was at said if there are banding on the legs then it could be an aggressive house spider or hobo spider. The patterning on it's abdomen is pretty though, I think I'm getting a new appreciation for spiders. ^_^ Juuuust as long as I don't have to touch them, not that appreciative. Not a wolf spider. The posterior row of eyes appears to be linear and forward facing. I'd go with a funnel spider (Agelenidae) of some sort. In fact, the PER is nearly straight. I'd go with Tegeneria, as everyone else is saying -- the house spider. I don't have enough experience with these guys to ID them to species.